Published: Jan. 2, 2018 at 05:03 p.m. Updated: April 5, 2018 at 11:36 a.m.
One day after his head coach stepped away from football, Carson Palmer followed suit. The Arizona Cardinals quarterback announced his retirement on Tuesday after 15 seasons in the National Football League. "Over the years, I've had teammates who decided to hang it up and I would ask them how they knew when it was time to walk away," Palmer wrote in a statement released by the team. "The answer was almost always the same: You just know. "For me that time is now. Why? Quite simply, I just know." 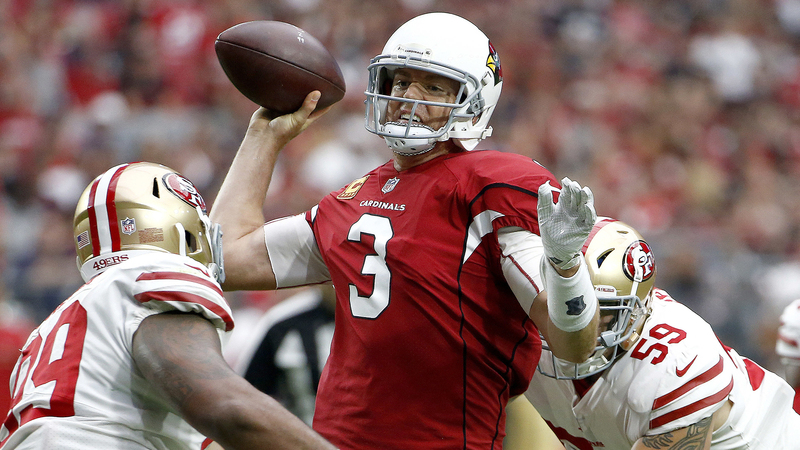 Spending the final five seasons of his career in Arizona, Palmer, 38, led the Cardinals to the postseason twice, though he only started playoff games during the 2015 season when Arizona lost in the NFC Championship game to the Carolina Panthers. His career marred by injuries, Palmer missed Arizona's playoff run in 2014 with a torn ACL and sat out Arizona's final nine games this year with a broken arm. The former first-overall pick was drafted by the Cincinnati Bengals in the 2003 draft out of USC and started 13 games in his second season, inheriting the starting role from Jon Kitna. Palmer had immediate success in Cincinnati, leading the Bengals to a division title in 2005 with Chad Johnson and T.J. Houshmandzadeh catching his passes. But in his first playoff game on his first snap, Palmer suffered a torn ACL after taking a low hit from Pittsburgh Steelers defensive tackle Kimo von Oelhoffen, dooming Cincinnati's best chance at a Super Bowl run. After things soured with the Bengals, who refused to trade Palmer at his request following the 2010 season, Palmer threatened to retire and Cincinnati selected Andy Dalton in the ensuing draft. However, Cincinnati finally agreed in October 2011 to trade Palmer, who was on the reserve/did not report list, to the Oakland Raiders. Palmer won just eight games with the Raiders, spending two seasons there with two coaches. See the top photos from Palmer's 15-year career. Rebounding from his lowest moment, Palmer rejuvenated his career in Arizona, thriving in coach Bruce Arians' vertical-passing scheme and enjoying a thriving connection with future Hall of Famer Larry Fitzgerald. In Arizona, Palmer experienced the best season of his long, winding career, a 13-3 march to an NFC West title and a first-round bye during which Palmer posted a career-best 104.6 passer rating and threw a career-high 35 touchdowns. Palmer finishes his career with a 92-88-1 record in 182 games, 46,247 passing yards, 294 touchdowns, 187 interceptions and an 87.9 passer rating. He is 12th all-time in passing yards and touchdowns. Arians and Palmer were tied at the hip; both joined the Cardinals organization in 2013 and retired within two days of each other at the close of the 2017 campaign. But now, Arizona enters into the great unknown, going into the offseason without a head coach, without a starting quarterback and potentially without their legendary wideout -- Fitzgerald, 34, is on the verge of retirement, and Arians' and Palmer's exits won't make his decision to return any easier. The Cardinals still boast a dynamic young running back in David Johnson and two standout defensive backs on a good defense in Tyrann Mathieu and Patrick Peterson and are led by an underrated general manager in Steve Keim. There are pieces there. But this offseason has suddenly become one of major change and big decisions in the desert. Arians and Palmer brought the Cards five years of consistent competence and, at times, excellence. The next five months will prove crucial if Arizona is to continue that trend or choose to reshape the organization entirely.